This DVD about the 36th Infantry Division takes place in World War II during the Winter of 1944-1945, Europe. , was fighting in the VI Corps of the U.S. Seventh Army was in an offensive position just southwest of Saint-Dié-des-Vosges. Our Series III DVD, Winter War: The Bulge and Beyond begins here continues through to mid-March 1945 as the 36th Division crosses the German border at Schweigen, Germany. The contents of this video show the action as was recorded by the 163rd Signal Photo Company, during these historic operations. The footage in this video is intended to be strictly that of the 36th Infantry Division and only shows other unit footage when two or more units are intertwined. Combat Reels has researched and compiled all of this raw combat film footage, then reformatted it into the DVD format for your viewing pleasure. 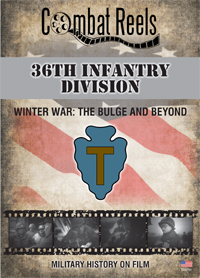 Great for veterans, families, military historians and military enthusiasts, this DVD has many different scenes of 36th Infantry Division soldiers. are seen resting at the famous rest camp of Bains-les-Bains, where men could go to forget about the war for just a bit. The 36th Then moves into the city of Hageunau along the Moder River. In March comes the 36th offensives from Mietesheim, to Surbourg, to Riedseltz. The series closes with the 36th crossing the German border and raising a Texas Flag. Enjoy these close up shots of the actual locations the 36th Division fought for and occupied. Examine as well, the equipment, vehicles, weapons, uniforms, helmet markings, and the faces of the men themselves on these candid reels of history. Order your copy today and enjoy these and many more up close shots of equipment, vehicles, weapons, uniforms, helmet markings, and of the faces of the men of the 36th Infantry Division themselves on these candid movie film reels of history, presented to you on popular DVD formatted video!